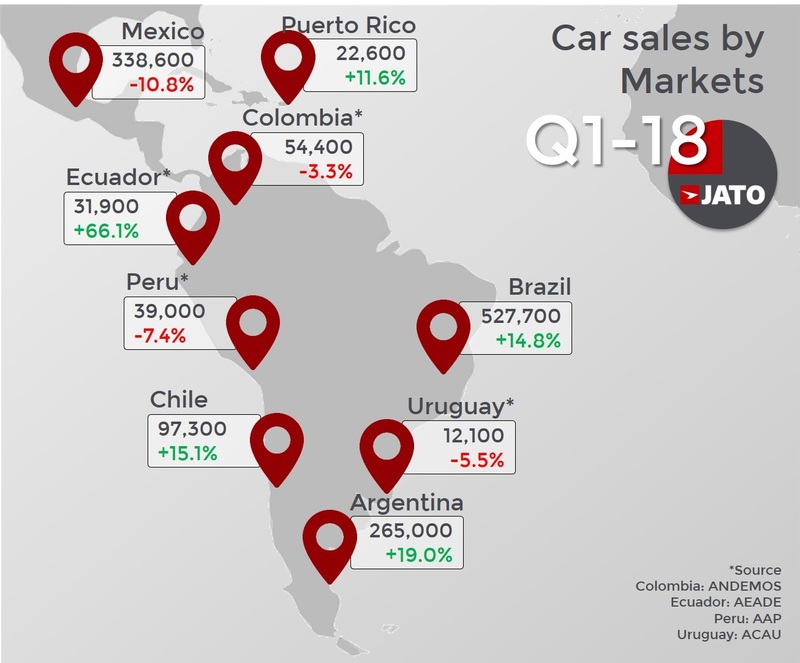 The Latin American automotive industry recorded a healthy start to 2018, with sales totaling 1.39 million units in the nine largest markets in the region. According to JATO Dynamics data and information shared by ANDEMOS Colombia, AAP Peru and AEADE Ecuador, 91,500 more units were sold than in Q1 2017, which represents a 7.1% increase. The overall market was boosted by the recovery of the Brazilian market, which posted an increase of 14.8% – jumping from 459,700 units in Q1 2017 to 527,700 vehicles in Q1 2018. Despite political instability in the country, the results from Brazil confirm the bull trend that started in the second half of 2017, when car and LCV registrations began to grow again after several years of crisis. “As a result of lower interest rates in Brazil and improving consumer confidence, we are now seeing a positive outlook in Latin America’s biggest car market. Whatever happens in Brazil will continue to affect the rest of the continent,” says Felipe Munoz, JATO’s Global Analyst. Results from Argentina also contributed to the overall growth. Argentina maintained its position as the third largest market in the region and gained ground on Mexico in second place, where growth stalled. Strong incentive campaigns and purchases trying to anticipate the devaluation of Argentinan peso explain part of the strong increase. In the meantime, the political uncertainty caused by the coming presiential elections in Mexico, along with higher restrictions to credit are having a negative effect on this market. There were also strong results in Chile, where the market recorded its best March performance since 2011, and in Ecuador, where car and LCV sales grew by 66%, reaching a new record. With 54,400 units registered between January and March 2018, the Colombian car market posted a small decrease, which can largely be explained by the upcoming government elections in June. Colombia has one of the lowest motorization rates in the continent. “The strong results from the first quarter confirm that there’s a new trend in Latin America – more trade agreements, new models and the SUV boom are now offsetting the adverse effect generated by the political uncertainty in some markets,” added Munoz. Although gasoline cars continued to dominate the market, ethanol cars performed well, as a result of demand in Brazil. Unlike in Europe, diesel cars are not popular in Latin America, and Alternative-Fueled-Vehicles are still rare. Private organizations and governments in Mexico, Colombia, Brazil and Argentina continue to promote AFV sales through lower tax policies, but they remain unaffordable for most of the population. Results by segment show that subcompacts were the most popular cars across the region, but demand for SUVs drove most of the growth. Sales of SUVs recorded a 25% increase during Q1 2018 jumping from 244,200 units in Q1 2017 to 305,600 during the first three months of this year. It is the first time their market share has exceeded 20%. In fact, demand increased everywhere, with double-digit growth in Brazil, Argentina, Chile, Ecuador and Puerto Rico. Small SUVs accounted for 52% of total SUV sales. City-cars gained traction as a result of the segment’s latest arrivals such as the Renault Kwid in Brazil and Argentina, and the Chevrolet Beat/Spark in Mexico, Ecuador and Colombia. Meanwhile, compact cars, led by the Toyota Corolla, lost ground as a consequence of more appealing compact SUVs (+23%). As a work vehicle, pickups continue to be very popular in many Latin American countries. Midsize pickups dominated, making up 60% of the segment’s total. Small pickups accounted for 22% of sales, followed by compact pickups at 12%. The Renault-Nissan alliance continued to lead sales in the region, due to the strong presence of both Renault and Nissan in markets like Mexico, Colombia, Argentina and Brazil. The French-Japanese group grabbed 18% of sales of the market. It was followed by General Motors, whose Chevrolet brand was the top-selling brand in Latin America. Volkswagen group occupied the third position, with 13% market share. 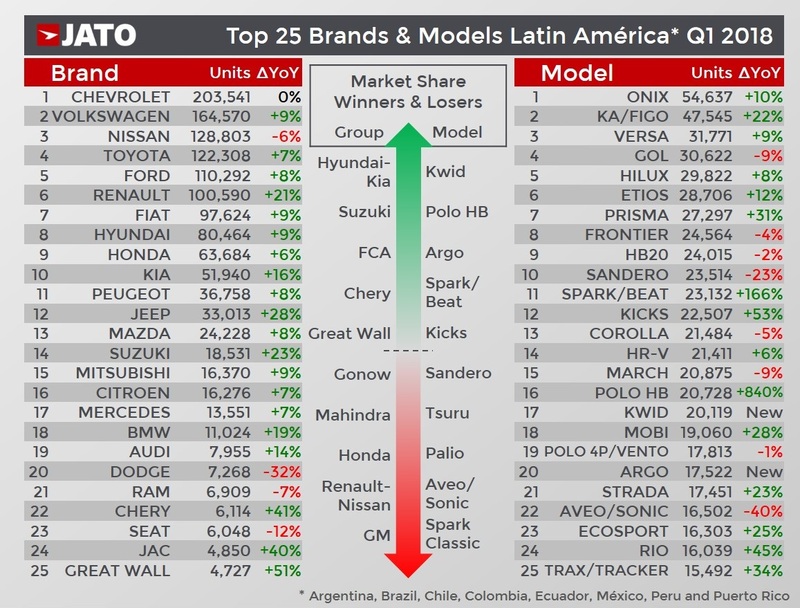 Hyundai-Kia was the top market share winner thanks to boosted demand in Mexico. In terms of brands, Renault outsold Fiat, and Jeep continued to climb in the SUV rankings, but still lagged behind Honda and Nissan. Premium car sales grew by 14%, but still represented a marginal part of the market with only a 3% share. Meanwhile, Chinese brands sold 32,000 units, representing a 2.3% market share and a volume increase of 43% compared to Q1 2017. The Chevrolet Onix was the most popular car in Latin America, with 75% of its sales coming from Brazil. It was a good quarter for the Ford Ka/Figo, Chevrolet Prisma and Beat/Spark, Nissan Kicks (the top-selling SUV in the region) and the Volkswagen Polo hatchback, as well as the new Renault Kwid, Fiat Argo, Jeep Compass, Renault Captur, Hyundai Accent, Volkswagen Tiguan, Suzuki Swift, Honda WR-V and the Volkswagen Virtus. Conversely, the Volkswagen Gol, Renault Sandero, Chevrolet Aveo/Sonic, Volkswagen Jetta, Fiat Toro, Nissan Sentra, Volkswagen Voyage, Up y Fox, Honda Civic, Fiat Palio y Siena, Ford Focus y Nissan X-Trail all registered declines. Many thanks to Oliverio Garcia from ANDEMOS Colombia, Alfredo de las Casas from AAP and Oscar Calahorrano from AEADE.